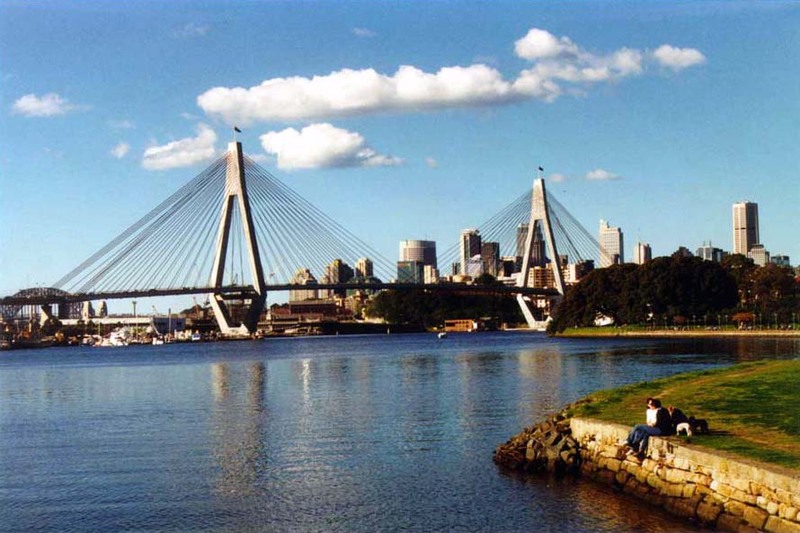 The ANZAC Bridge Spanning Johnstons Bay, the ANZAC Bridge is one of Sydney's outstanding landmarks. Opened in December 1995, at a cost of $170 million, it provides a key link between Sydney City and the suburbs to the west. Via the City West Link and Victoria Rd it is the major east west route to the western suburbs and the M4 motorway to the Blue Mountains. There is no toll on the ANZAC Bridge. 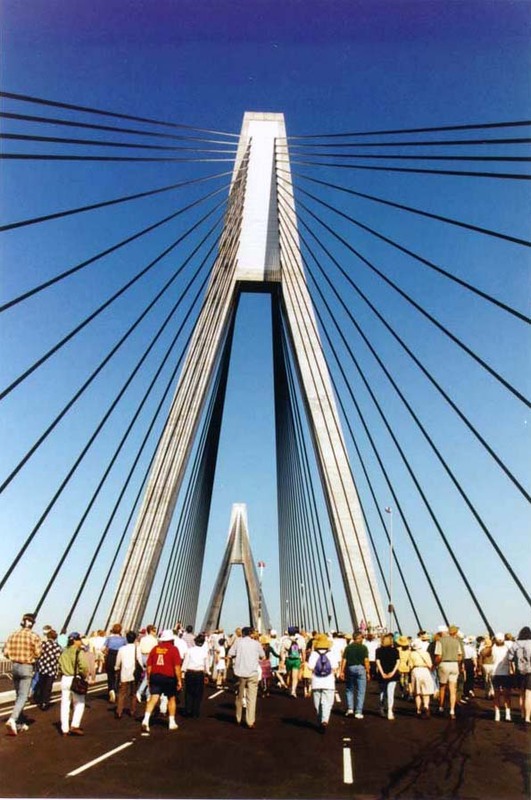 The Anzac Bridge has a main span of 345m, and a total length of over 800m. From the two 120m high towers, 128 stay cables support the reinforced concrete deck. It is the longest cable-stayed span bridge in Australia but well down the list on a world scale. 1. 3. The Anzac Bridge bridge replaced the adjacent old Glebe Island bridge, an electrically operated low-level steel swing bridge which opened in 1903. 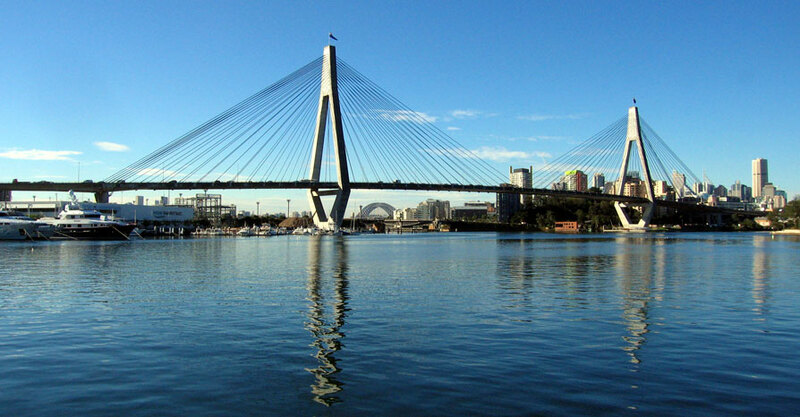 The new bridge initially adopted that name, Glebe Island bridge. 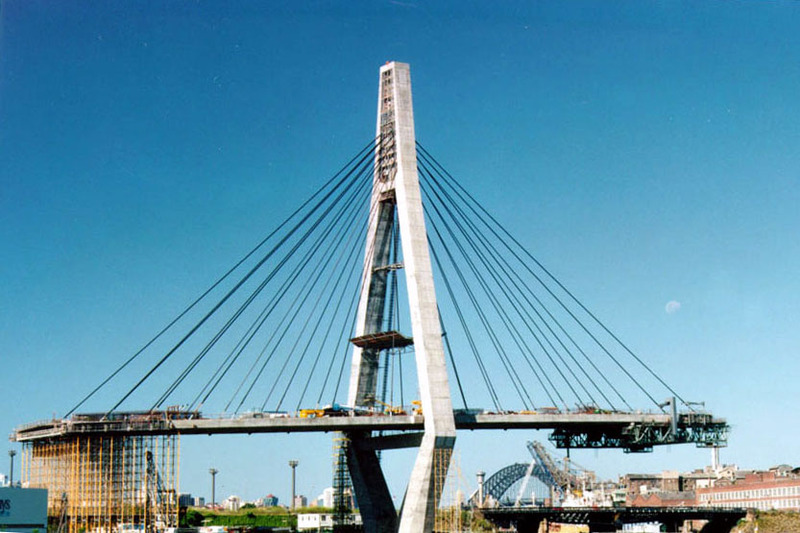 The bridge deck was constructed in 10 metre concrete segments. During construction, each segment cast on the land side was balanced by casting an equal one over the water. Segments each weighed about 460 tonnes. The finished deck does not rest on the horizontal beams of the towers. It is fully supported by the cables. The gap is visible in the picture to the right. 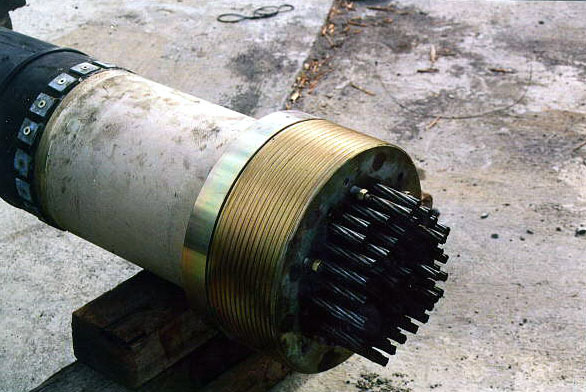 Left, the multiple wire strands within the stay cable anchorage assembly. Each of these strands contains seven galvanised wires covered in a plastic sheath. 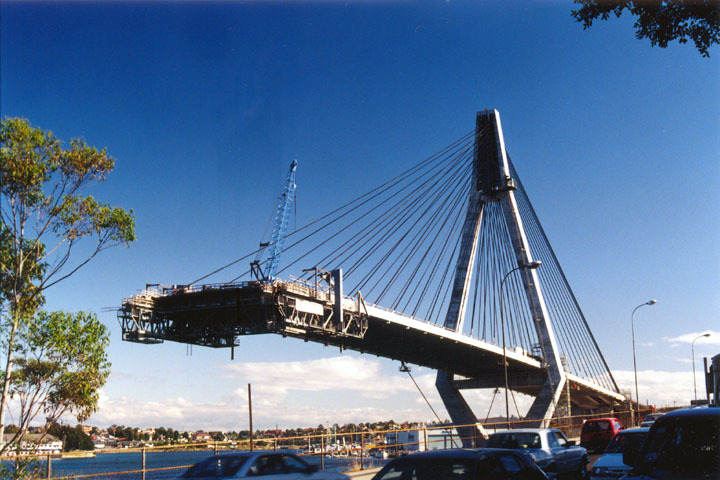 The closing of the two halves of the bridge took place on 24th July 1995 in the early evening to give the bridge time to cool and time for the final concrete pour to gain strength before morning to avoid movements due to temperature changes. MP for Sydney, Peter Baldwin joined Premier Bob Carr and Roads Minister Michael Knight for the opening on Sunday 3rd December 1995. The opening was followed by a Community Walk with 65,000 people paying for tickets - the proceeds going to the Smith Family. The Smith Family provides help and relief to people and families in crisis and financial difficulties. 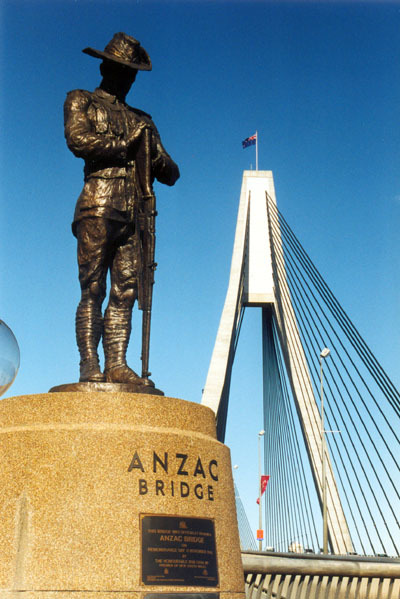 On the 80th anniversary of Armistice Day, the 11th November 1998, the premier of NSW, Bob Carr, renamed the bridge as the ANZAC Bridge as a memorial to members from both sides of the Tasman who formed the Australian and New Zealand Army Corps - the ANZACs. 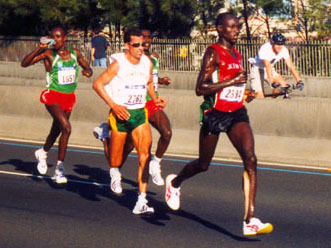 Later, the ANZAC Bridge made a spectacular back drop to the 2000 Sydney Olympics Marathons at the 28km mark.